18 And Benaiah the son of Jehoiada was over both the Cherethites and the Pelethites; and David’s sons were chief rulers. 1 Now after this it came to pass, that David smote the Philistines, and subdued them, and took Gath and her towns out of the hand of the Philistines. 6 Then David put garrisons in Syriadamascus; and the Syrians became David’s servants, and brought gifts. Thus the LORD preserved David whithersoever he went. 13 And he put garrisons in Edom; and all the Edomites became David’s servants. Thus the LORD preserved David whithersoever he went. Getting a promise from God like David did (The Davidic Covenant - II Samuel 7:1-17; I Chronicles 17:1-15) can give you a good bit of confidence. David goes about to expand his kingdom. By the way, to conquer or be conquered was a rule of thumb in those days. To allow your neighbor to amass an army on your borders without taking action meant your certain demise down the road. David expands his kingdom all the way to the Euphrates River in this passage (verse 3). 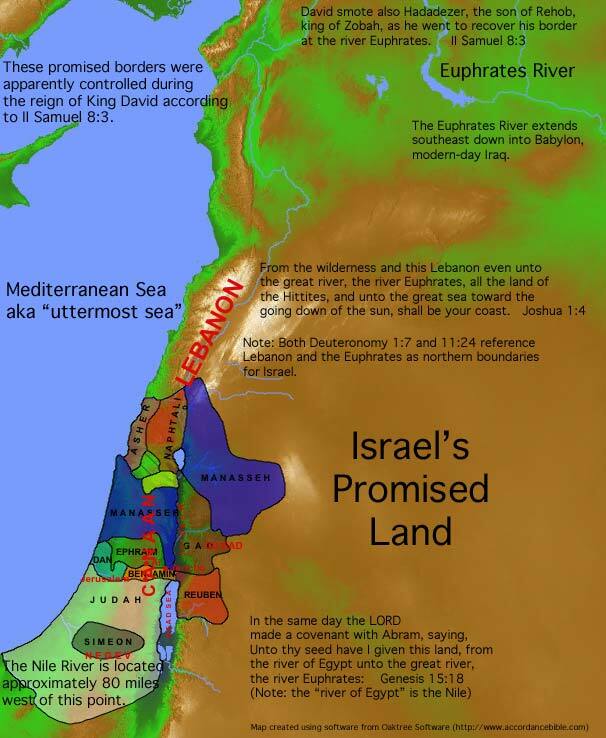 As a matter of fact, this is the border God had promised Abraham's descendants back in Genesis 15:18 (see notes) as part of the Abrahamic Covenant. David has finally acquired control of all the land that God had promised Abraham in Genesis 15:18. Here we see that David defeats and subjugates the Philistines: "...David took Methegammah out of the hand of the Philistines." That phrase means he took control of their mother (capital) city. Then David defeats and subdues the Moabites. That's interesting inasmuch as David's great grandmother (Ruth) was born and raised in Moab before she left home with Naomi for Israel. Moreover, we see in II Samuel 8:2 that some fascinating method of measuring by David was implemented with the Moabite prisoners of war to determine which two-thirds of them would be executed, leaving the remaining one third as servants of Israel. Perhaps these Moabite prisoner executions were excessive. When David is denied permission to build the Temple, he is told in I Chronicles 22:8 (see notes), "Thou hast shed blood abundantly..." This could be one of those times. Then David goes after Hadadezer, king of Zobah, which was a Syrian province or kingdom to the south of Coele-Syria, and extending from the eastern slopes of Lebanon north and east toward the Euphrates. This king had a chariot battalion; after his defeat, the chariot horses were intentionally crippled by David's army to prevent a subsequent attack. Saul and David had war with the kings of Zobah (I Samuel 14:47, see notes; II Sam. 8:3; II Samuel 10:6, see notes). It's no wonder King Toi brought offerings to David - better to be David's friend than his enemy. David had just conquered everything around him, and after the defeat of the Edomites, his name was known everywhere. I think we can assume that David's border with Egypt probably extended to the Nile River, thus fulfilling Genesis 15:18 (see notes), "In the same day the LORD made a covenant with Abram, saying, Unto thy seed have I given this land, from the river of Egypt unto the great river, the river Euphrates:" It would appear that this was David's goal. David was definitely on a roll, and I Chronicles 18:13 tells us why, "Thus the LORD preserved David whithersoever he went." Then take special notice of I Chronicles 18:14, "So David reigned over all Israel, and executed judgment and justice among all his people." David was a just king, and "the LORD preserved David whithersoever he went" (verse 13). His regime was not one of oppression or cruelty. His became the Old Testament model for reigning. The office of high priest was shared by Abiathar and Zadok (II Samuel 8:17; I Chronicles 18:16) during David's reign. See the notes on I Samuel 22:6-23 to understand how this came to be. Zadok was a descendant of Aaron's son Eleazar, while Abiathar was a descendent of Aaron's other son, Ithamar. The priesthood had been assigned exclusively to the descendants of Eleazar's son, Phinehas, back in Numbers 25:13 (see notes) because of his decisive action when Israel stumbled into idolatry. In subsequent generations, this decree seems to have been overlooked by the Israelites. Eli, Samuel's mentor (I Samuel 2, see notes), was not a descendant of Phinehas. Later on after David's reign, while Abiathar (a descendant of Eli) and his ancestors had enjoyed the office of high priest, he was deposed by Solomon because he took part in the attempt to raise Adonijah to the throne instead of Solomon (I Kings 2:13-46, see notes). Thus ended the line of priests through Ithamar just as had been told Phinehas back in Numbers 25:13 (see notes); it just took a few hundred years. Zadok's line became the exclusive line for the high priests. As a matter of fact, it is believed by many that the name "Sadducees" has "Zadok" as its root. In Jesus' day, the Sadducees exclusively filled the office of high priest. Before his death, Jonathan was heir apparent to King Saul's throne. One problem though - God had discontinued the line of kings from Saul (I Samuel 13:8-14, see notes) and anointed David instead (I Samuel 16:1-13, see notes). Now that David is in a position to do so, he finds the crippled son of Jonathan, Saul's grandson, and brings him into his care. You will recall that Mephibosheth became crippled from a fall as his nurse was fleeing with him after the deaths of Saul and Jonathan (II Samuel 4:1-12, see notes). Typically, a king would do everything possible to exterminate the descendants of previous kings in order to prevent their ascension to the throne at a later time. David, however, honors his friendship with Saul's son, Jonathan. He gives him servants and promises to take care of him for the rest of his life. Saul's former servant, Ziba, strikes it rich here along with his entire household. They get the pleasure of serving Mephibosheth, compliments of David. So, David has subdued his enemies, built a nice house in Jerusalem and extended kindness to Saul's descendant; he's on a roll. Incidentally, this man Ziba facilitates this Mephibosheth/David connection and subsequently gets a very nice job of taking care of Mephibosheth on behalf of King David. However, Ziba later deals treacherously with Mephibosheth - even lies about him (II Samuel 16:1-4, see notes). Sometimes it's simply hard to get good help.